Broadly speaking, board games are really just light role playing games. Monopoly simulates being a turn-of-the-century robber baron, while Risk asks you to step into the spurs of a primary-colored Napoleon. Even chess uses the tropes of feudalism to abstract out its two-toned power struggle. However satisfying board games are mechanically, they’re not known for telling a good story. That has traditionally been the domain of such role playing games as Dungeons & Dragons, and the complexity of the rule sets that facilitate that storytelling has meant these games are, again broadly speaking, only accessible to teenaged minds and older. Something wonderful happened in 1989 with the release of Hero Quest by Milton Bradley. Designer Stephen Baker decided to work backwards from an RPG, shaving off complexity wherever he could, until he made a legitimate hybrid RPG/board game. Hero Quest had all the most basic RPG elements (fighting monsters, navigating mazes, and finding loot), but it was easier to understand and required fewer hours to play than other RPGs because it used fewer dice and had more limited rules. Hero Quest’s game system was lean and fun, but if it had a weakness it was originality. The game borrowed on all the old clichés of the RPG genre, and the story was ultimately forgettable. Artist John Ariosa made a strong collection of pieces for the game. From the cover art shown here to the renderings of individual times of loot, the art for the game is as consistent as it is fantastic. Fast forward to 2012 and upstart publisher Plaid Hat Games (Summoner Wars) hopes to modernize the hybrid RPG board game with Mice and Mystics. The rules are fluid if a little quirky, but between a hefty dose of originality and high production values designer Jerry Hawthorne has a real hit on his hands. In my opinion this box set is an instant classic, fit to sit alongside Hero Quest in any collection. The hook is as simple as it is disarming. The king lies ill, and both he and his kingdom have become slaves to the witch Vanestra. Players take on the role of the loyal members of the king’s court, who are jailed by the witch for plotting against her. To escape their prison and save the king they must turn themselves into mice. Instead of thick steel blades they’ll wield slender sewing needles, trading broad wooden shields for a shirt’s button. Players maintain their human capabilities, but must apply them to new challenges on a new scale. Mix in a dose of magic and a touch of political intrigue and you have all the elements for a very compelling story. Fighter Colin and healer Tilda square off against some roaches and a centipede. Smaller minions, as well as mice, can gather up to four to a square and there are special rules for entering and exiting melee. What makes the modular tile system really stunning is the obfuscation of the movement spaces. It’s apparent where miniatures can go when you know how to interpret the lines, but otherwise the art and the mechanics of the play space merge flawlessly. Instead of a dry campaign manual for the game master, the set comes with a thick volume entitled Book One: Sorrow and Remembrance that allows the players to run the game themselves. It reads like a story book, with florid introductions that are read aloud at the beginning of each game session. Turning points often fall in the middle of a game, and dialogue or narrative plot points are read aloud at the table. It’s during these interludes that the different characters really open up—feisty Nez the tinker, stoic Maginos the wizard, snide thief Filch. You can even purchase a collection of MP3s to play during a game, professionally produced and interpreted by actor Rich Sommer (Mad Men). Proceeds will benefit the Jack Vasel Memorial Fund. However, some sections (especially the prologue) run a little long. Reading them out loud prior to your introductory game is a surefire way to bore your players before you’ve even begun. My recommendation would be to jump right in. During play the game takes every opportunity to remind players of their scale. Water from a small drain will pull them downstream and off the map, while mice can scale a table with a fishhook and twine or catapult each other across the map with a dinner fork. Mice can scramble up and out of the 2D playing field, or fall down into it, requiring sections of the modular game board to be flipped to an alternate side. But the system also allows for character growth, making players more capable from game to game with added skills and mouse-themed loot. Hawthorne even added achievements to the game, medallions granted for completing plot-related quests. These unlockables grant boons to the entire party and make the heroes much more powerful. Light RPG elements are all over the game, and each chapter in the story tends to have its own set piece event. Here the heroes have the option of using a dinner fork to assault the rats while they gamble, or don disguises and try to join in their game of chance. As with most systems in the game, a card-based perk system runs on cheese. It was almost comical how much cheese was flying around at the table. Every time cheese turns up on the face of the custom dice either a player or an enemy gets a wedge. Eat cheese to level up, cast a spell, or use an ability during your turn. When the enemy’s wheel is filled more of them surge onto the map, slowing the heroes and complicating their journey. It would have been easy and cheap to print cardboard tokens for players and enemies, to let the game stand on narrative and atmosphere alone. But Plaid Hat added to the value and immersion by shipping it with 22 miniatures. These aren’t simple meeples, but are actually complex, multi-part minis that come preassembled. Roaches, centipedes, spiders and rats all lunge from their bases ready to fight, and each of the 6 playable mouse heroes has their own figure as well. However, it feels like the number of sculpts on the enemies was kept low to reduce cost, and the hero figures all share a similar profile. This can cause some problems during play by making identification at a glance challenging. Dedicated players will want to take the time to paint the minis, a process made much easier thanks to detailed instructions at the Plaid Hat website. A clever sideboard keeps track of the initiative order, monster hit points, the turn tracker, party loot… it’s all there in a thematically designed grandfather clock. I most enjoyed the childlike playfulness that is pervasive throughout the game, something that kept my group of play testers (aged 7, 8, and 9) giggling as they drove Vanestra’s minions from the map. It is a cooperative game, so maps have fail states and may need to be replayed to advance the story. But consequences are kept purposefully light. Players are not killed, merely captured and can be freed later. But this is not a game solely for children, and anyone looking for a fast-playing light RPG with great combat mechanics should check it out. The best praise I can give it is that I’m looking forward to giving a few copies away this holiday, to young and old gamers alike. 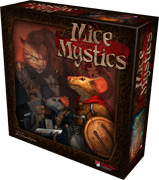 Mice and Mystics was designed by Jerry Hawthorne and published by Plaid Hat Games.